Face attribute models are used for retrieval tasks like "find all actors with green eyes and curly hair" or for applications used to measure emotional states like smiling / not-smiling. We investigate model architectures, loss functions and training sets to determine the optimal combination for distinguishing facial attributes in a weakly-supervised setting. We then compared platform.ai’s default model against our new model, using a variety of projections based on linear and non-linear dimensionality reduction methods and discovered that the new model can more easily identify attributes like gender, race, age, baldness, hair color and attractiveness. 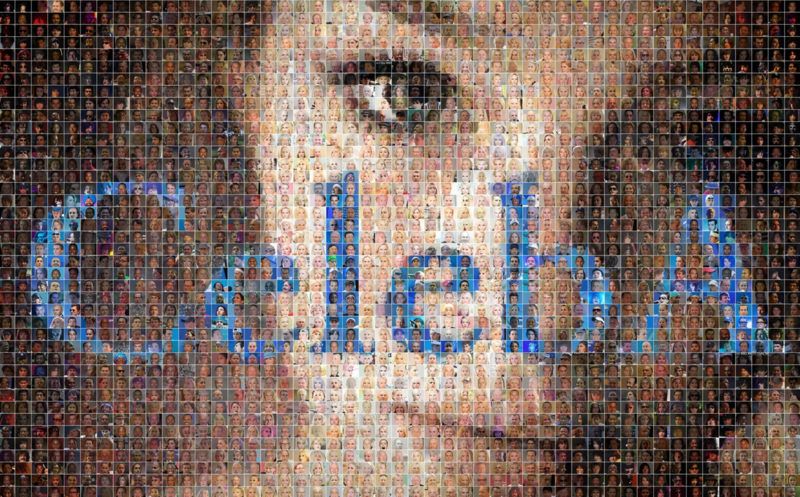 Celeb-A is a large-scale face attributes dataset with more than 200K celebrity images, consisting of 10,177 celebrity identities with 40 binary attribute annotations per image, sized 178 × 218 pixel. We used 3,392 images of Celeb-A for testing. In addition, we added an attribute for race by manually labelling 500 images from the test set. We selected 100 images for each of the following categories: Caucasian, Black, Asian, Indian and Latino. Only obvious cases were labelled, and in many instances the race of the subject was confirmed through a Google Image search of their photo. We’ve used reflect padding for comparisons, as it gave better separation for features on scatter plots than zero padding and introduces extra information to the network. Softmax is the most commonly used loss function for facial recognition problems, however the loss has some drawbacks. One of them is that it does not explicitly optimize the feature embedding to enforce higher similarity for intra-class samples and diversity for inter-class samples, which results in a performance gap for deep face recognition under large intra-class appearance variations like pose variations and age gaps. ArcFace is also easy to implement, does not require much extra computational overhead and is able to converge quickly. We selected a list of attribute comparisons that are mostly complimentary, to evaluate usefulness of the network for proposed use case. Scatterplots allow us to clearly see the results of separation only on the labelled attributes we’re interested in. Dimensionality reduction techniques were taken primarily from the SKLearn, though a few other libraries were also used. The projections plotted on platform.ai are the ultimate purpose of our research, however all of the projections are plotted at once, which makes it difficult to observe all of the clusters. We performed pair-based comparisons on each set of models, datasets and loss functions to identify which of these helped improve distinguishing facial attributes. The intuition was that VGGFace2 would perform best because of its high variations in terms of subject poses, age, etc. compared to "emore", which is not as diverse, and general purpose ImageNet dataset. The experiments proved our intuition. VGGFace2 pre-trained models pay more attention to the colors, while ImageNet models seem to pay more attention to the texture. Besides that, all ImageNet’s projections of attributes have a large spread and don’t separate well from each other. We also experimented with 2 loss function ArcFace and Softmax. ArcFace performed best which can be credited to its tendency to enforce higher inter-class disparity and intra-class compactness of attributes, unlike the Softmax loss function, which does not explicitly optimize the feature embedding. When it came to the choice of model architecture we knew that it has to be ResNet-34 to match platform.ai’s current model. We still wanted to experiment with different model architectures. An interesting find was that SE modules seem to decrease the quality of manifold projections, despite increase in classification accuracy. This may be due to the ability of SE modules to ease passing the unmodified information from previous residual blocks further into the network, which allows for more complex features. We used scatter plots as quick visual tool for demonstrating the results of separation only on the labelled attributes of interest. After experimenting with different combinations, we concluded that ResNet-34 model, trained on VGGFace2 dataset, using ArcFace loss function should deliver the best results. We’ve discovered that UMAP provides best projections for all evaluated models, while t-SNE also manages to cluster evaluated attributes somewhat well. In most cases some PCA axis are able to provide gradients of attributes even when non-linear methods are not effective. ICA projections are also good, and are often better than PCA, though fail when manifold methods fail. Gender seems to be the easiest feature to classify for both models. Most PCA axes for both networks also allow clear separation. We ‘cherry picked’ plots containing clusters with a high inter-class disparity and intra-class compactness. Both models have many projections where no significant clustering is exhibited; these results have been excluded. Age - seems to be most easily classified in white women. Both older women and young, fair-haired women cluster nicely together. Hair color - gradient of color across all data, though there doesn’t appear to be any clusters of other attributes in the projection. The clusters in Figure 6 aren’t perfect; there are some Asians and old men outside of the clusters, though the poor clustering is suspected to be due to projections rather than the model. The new model improves on the default one in distinguishing between more facial attributes, producing a much higher inter-class disparity and intra-class compactness amongst attributes. As we suspected, the model architecture, training set and loss function all played an important role in achieving this increased performance. The superior results of ArcFace’s loss function can be credited to its tendency to enforce higher inter-class disparity and intra-class compactness of attributes. The superior results of VGGFace2 can be credited to the high variations in terms of subject poses, age, etc. compared to ImageNet general purpose dataset. In future, preprocessing the dataset with AI Fairness 360  to reduce the dataset bias could further improve the quality of features. Deng, Jia, et al. ImageNet: A Large-Scale Hierarchical Image Database. 2009 IEEE Conference on Computer Vision and Pattern Recognition, 2009. Deep Insight. Report Your Verification Accuracy of New Training Dataset 'insightv2_emore', GitHub, Deep Insight, 2018. Cao, Qiong, et al. VGGFace2: A Dataset for Recognising Faces across Pose and Age. 2018 13th IEEE International Conference on Automatic Face & Gesture Recognition (FG 2018), 2018. He, Kaiming, et al. Deep Residual Learning for Image Recognition. 2016 IEEE Conference on Computer Vision and Pattern Recognition (CVPR), 2016. Hu, Jie, et al. Squeeze-and-Excitation Networks. 2018 IEEE/CVF Conference on Computer Vision and Pattern Recognition, 2018. Deng, J., Guo, J., Xue, N. and Zafeiriou, S. ArcFace: Additive Angular Margin Loss for Deep Face Recognition. [online] arXiv.org, 2018. Bellamy, R. K. E., Dey, K., Hind, M., Hoffman, S. C., Houde, S., Kannan, K., … Zhang, Y. (2018). AI Fairness 360: An Extensible Toolkit for Detecting, Understanding, and Mitigating Unwanted Algorithmic Bias. [online] arXiv.org, 2018.